Sherman County lies entirely within the High Plains section of the Great Plains physiographic province. The county consists of nearly flat to gently rolling uplands (Pls. 3B, 4A) dissected in several areas by relatively shallow valleys. The upland plains surface slopes gradually eastward at the rate of about 13 feet to the mile. The maximum relief of the county is about 700 feet. The highest point is about 8 miles south of Kanorado where the altitude of the surface is about 4,000 feet. At several localities in southeastern Sherman County the altitude is approximately 3,300 feet. 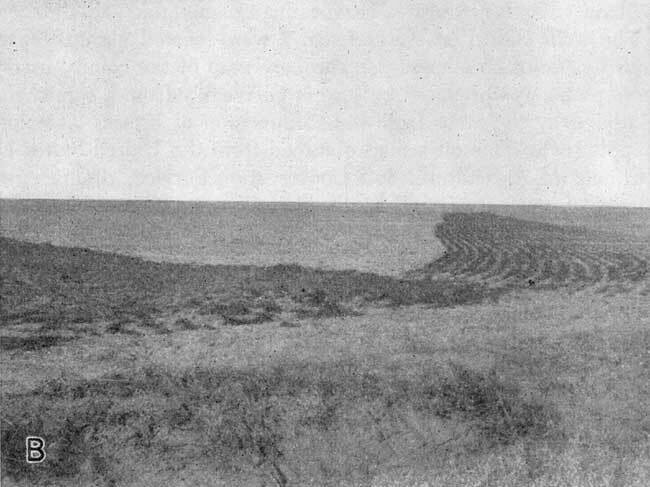 Plate 3B--View of High Plains surface, SE sec. 20, T. 9 S., R. 42 W. View looking northwest along furrows of drilled wheat. Common features of the nearly flat upland plains are the numerous shallow undrained depressions (shown on Pl. 1 as intermittent ponds) which range from a few tens of feet to more than half a mile in diameter. After a heavy rain many of these depressions hold water, thus becoming temporary ponds. Some of the larger and deeper depressions contain water for many weeks or months after rains (Pl. 4). The relation of these depressions to ground-water recharge is discussed on page 43 and the theories of their origin are discussed [in the section on the Quaternary Period]. Plate 4--Undrained upland depressions in Sherman County. A, Small undrained upland depression of the "buffalo wallow" type in the NW SW sec. 11, T. 9 S., R. 42 W., looking north. B, Large undrained depression in sec. 2, T. 9 S., R> 40 W. View looking southwest. Depression is larger than typical undrained upland depressions and may have been formed by collapse of underlying beds. Sherman County contains the headwater areas of North and South Forks of Sappa Creek. The county is crossed by Beaver Creek, North Fork Beaver Creek, and North Fork Smoky Hill River. All streams drain northeastward or eastward with the exception of North Fork Smoky Hill River, which flows southeastward as it leaves the county. Most streams are intermittent, flowing only during and after rains. In 1949, a year of above average precipitation, the northeastern part of Beaver Creek had a continuous flow of a few gallons a minute as did North Fork Smoky Hill River in its eastern reaches in Sherman County. The climate of Sherman County is of the semiarid type and is characterized by abundant sunshine, moderate precipitation, and a high rate of evaporation. During the summer the days are hot, but the nights are generally cool. The summer heat is relieved by good wind movement and low relative humidity. The winters generally are moderate with occasional severe cold periods of short duration and relatively little snowfall. According to the U. S. Weather Bureau, the normal mean annual temperature at Goodland is 51.9° F. The lowest temperature on record is -23° F. on December 9, 1919, and the highest temperature recorded is 111° F. on July 25, 1940. The average length of the growing season is 161 days and has ranged from extremes of 131 to 190 days. Killing frosts have occurred as late as May 27 and as early as September 20. The normal annual precipitation at Goodland reported by the U. S. Weather Bureau is 17.98 inches. The lowest annual precipitation reported is 10.52 inches in 1934 and the highest is 30.89 inches in 1915. About 77 percent of the precipitation falls during the 6 months from April through September when the growing season is at its height and moisture is needed. 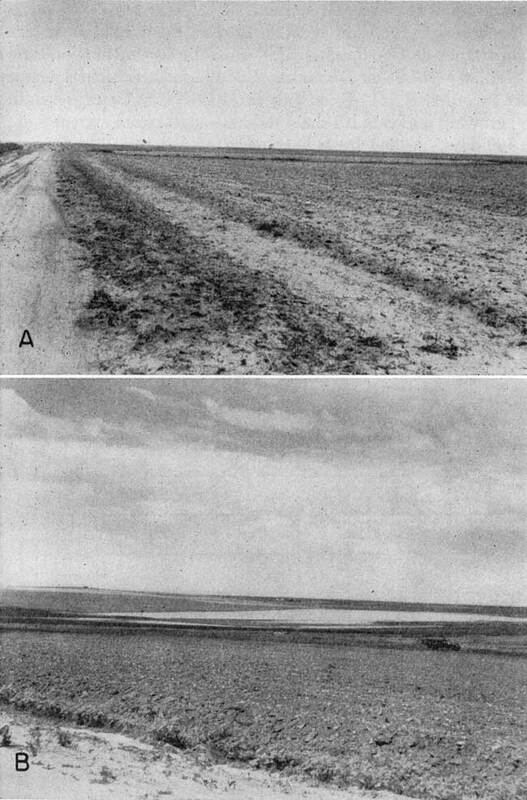 The annual precipitation from 1906 to 1950 and the cumulative departure from normal precipitation at Goodland are shown on Figure 3; the normal monthly precipitation is shown on Figure 4. Fig. 3--Graphs showing annual precipitation and cumulative departure from normal precipitation at Goodland. Fig. 4--Graph showing the normal monthly precipitation at Goodland. According to the 1950 Federal census, the population of Sherman County was 7,373; and for 1946, the Kansas State Board of Agriculture reported a population of 6,402 [Note: Sherman County population was listed as 6,760 in 2000 U.S. census, with a population per square mile of 6.4 (KU Institute for Policy & Social Research).]. In 1886, at its date of organization, the county had 2,820 inhabitants. By 1890 the population had risen to 5,632 but by 1900 had declined to 3,341. The population increased to 5,592 in 1920, to 7,400 in 1930, but dropped to 7,352 in 1940. Goodland, the county seat of Sherman County, had a population of 3,306 in 1940, and 4,690 in 1950 [4,948 in 2000]. Kanorado had 359 inhabitants in 1940 and 285 in 1950 [248 in 2000]. Sherman County ranks 70th in population among the 105 counties within the State. Sherman County is crossed by the main line of the Chicago, Rock Island and Pacific Railway Company, which crosses the county from east to west through Edson, Goodland, Ruleton, and Kanorado. Two hard-surfaced highways traverse Sherman County. The east-west trending U. S. Highway 24 bisects the county and is roughly parallel to the railroad. State Highway 27 extends from north to south across the county and passes through Goodland. Most of the remainder of the county is served by improved county or township roads. Agriculture is the chief occupation in Sherman County. According to the Thirty-sixth Biennial Report of the Kansas State Board of Agriculture, there were 584 farms in the county in 1948. The approximate acreage of the county is 675,200, most of which is in farmland. In 1948, major crops were harvested from 221,185 acres. Wheat was the principal crop, about 82 percent of the cultivated acreage being used for its production. The acreage of major crops grown in 1948 is shown in Table 1. A very small acreage is irrigated. A large percentage of the land area is in pasture. Table 1--Acreage of major crops grown in Sherman county in 1948. Data from 36th Biennial Report of the Kansas State Board of Agriculture (1948), p. 377. Placed on web Aug. 1, 2008; originally published Nov. 1953.